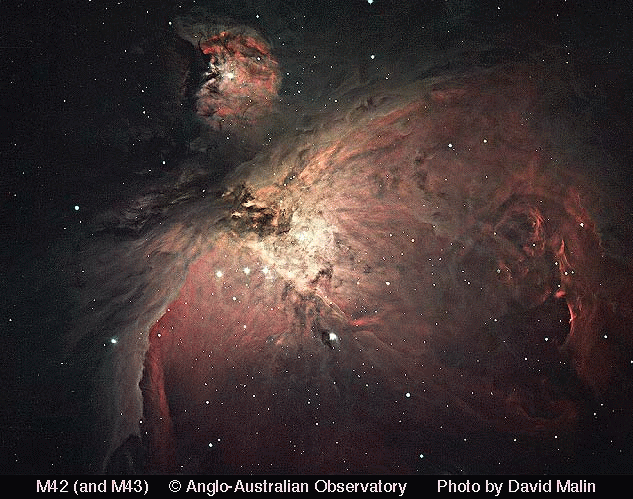 How did the Messier catalogue come about? Charles Messier was a French astronomer, who lived from 1730 to 1817. His passion was comets, and he would spend many hours at his telescope hunting for these objects. In fact, in his life he discovered no fewer than 13 comets. But Messier is far more famous for the catalogue that he compiled. These were objects which Messier noted could be mistaken for comets but were not comets. They were therefore objects to avoid in his opinion. It is rather ironic that nowadays we look upon the Messier catalogue as containing some of the most fascinating objects in the sky! The first edition of Messier’s catalogue was produced in 1774 and had 45 objects in it. He published his final version of his catalogue in 1781 and this version contained 103 objects. However, the image above has 110 objects in it. Object 104 (the “Sombrero” galaxy) was added in 1921 as it was realised it had been noted by Messier, even though he hadn’t included it in the final version of his catalogue. Similarly, objects 105-110 have been added by others, on the grounds that they were all noted by Messier, but for one reason or another were not included in his 1774 catalogue. I will now briefly mention 4 objects in the Messier catalogue. I have chosen these four as they are (a) well known and (b) are all astrophysically different. 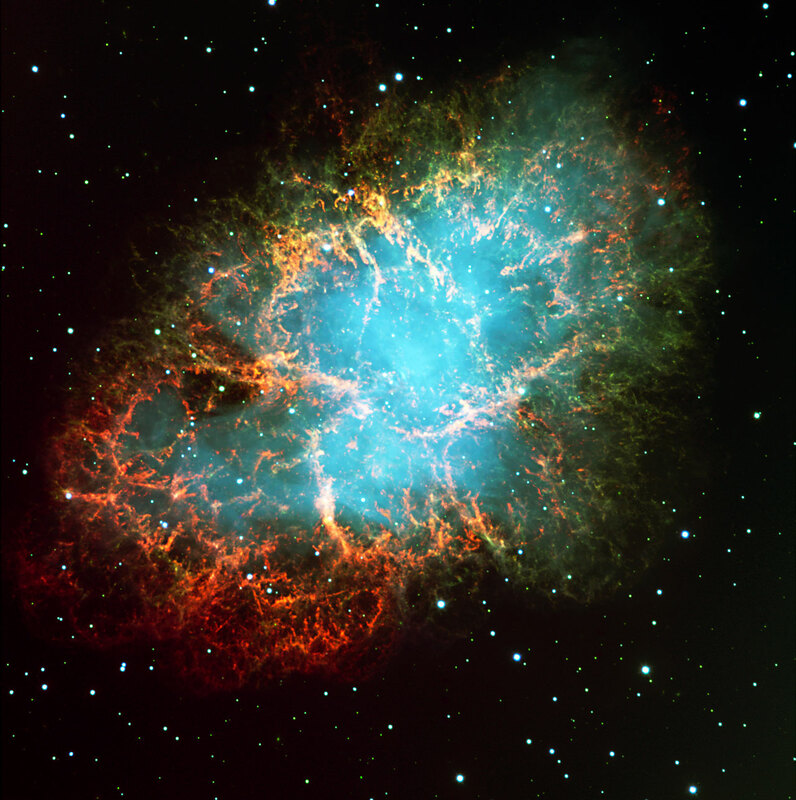 The first object in the Messier catalogue, and the first object of my four, is the Crab Nebula, Messier 1. The Crab Nebula, Messier 1. It is a supernova remnant of a star which exploded in 1057. The Crab nebula is an example of a supernova remnant. That is, it is the remains of a massive star which has exploded. In fact, we know from contemporary records that the star which exploded to produce the Crab Nebula did so in 1057. It was so bright that the explosion could be seen in the daytime for several weeks! As I will describle in a future blog, supernovae are vital to life, as it is in supernovae that most of the elements are formed. Messier 31, the Andromeda galaxy, was the first object to be identified as being beyond our Milky Way galaxy. In this blog I explained how this was discovered by Edwin Hubble, building on work done by Henrietta Leavitt using Cepheid variables. Messier 31 is the most distant object that one can see with one’s naked eye, lying at a distance of about 2 million light years! That is to say, the light we now see started on its journey to Earth 2 million years ago. Just to go out and see this object with your eye (either unaided or through a telescope) is a humbling experience, making one realise how vast the Universe is, and how small we are. 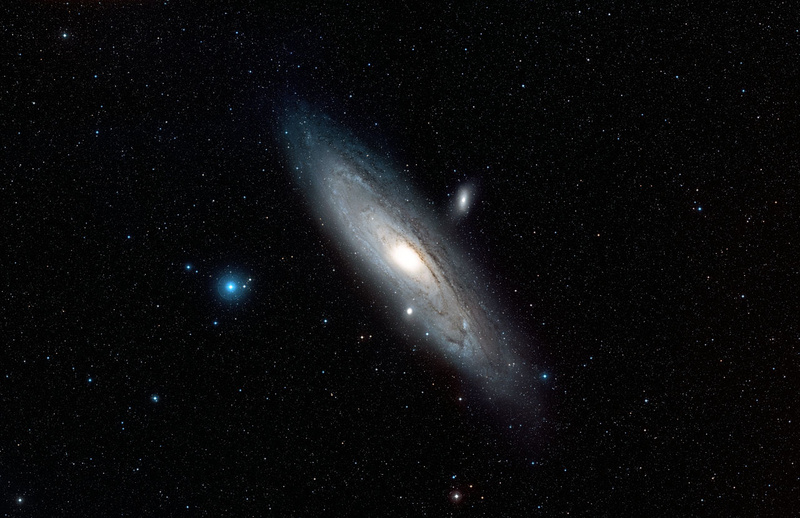 Messier 31 – The Andromeda galaxy. This is the most distant object that can be seen with the naked eye. Messier 42, the Orion nebula, is the nearest example of star formation to us. It is a beautiful object when viewed through a telescope, but just like M31, it is visible to the naked eye. It can be found in the famous Orion constellation, and is the middle bright object in the 3 “stars” which form Orion’s sword. The middle star is Messier 42. It lies about 500 light years away, and what we are seeing when we look at this object is gases (mainly hydrogen, but also other elements like helium, nitrogen, oxygen) glowing because of the hot, energetic stars in the trapizium towards the cloud’s centre. Messier 42 – the Orion Nebula. This is the closest example of a star forming region to us and can be seen with the naked eye. Messier 57, the Ring nebula, is one of my favourite objects to see in the Summer sky. It can be found in the constellation Lyra, not too far from the bright star Vega. It is thus high in the sky in the Northern Hemisphere throughout the summer months. It is an example of what is called a planetary nebula, but in fact has nothing to do with planets. A planetary nebula is produced when a star like our Sun throws off its outer layers as it comes towards the end of its life. The gases glow via the same process which causes the gases in the Orion nebula to glow. All low mass stars like the Sun will go through a planetary nebula phase as they die, this phase typically lasts about 50,000 years. What is left at the centre of a planetary nebula is a white dwarf, the remnant of the star. The gases forming the planetary nebula will cool and fade over time. 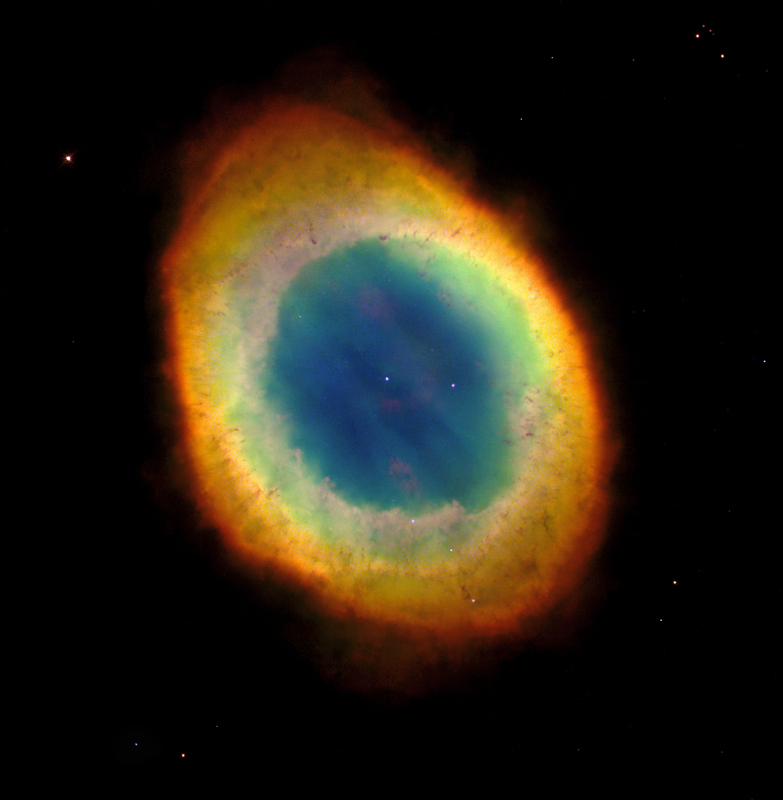 Messier 57 – The Ring Nebula. It is an example of a planetary nebula, a dying star blowing off its outer layers. 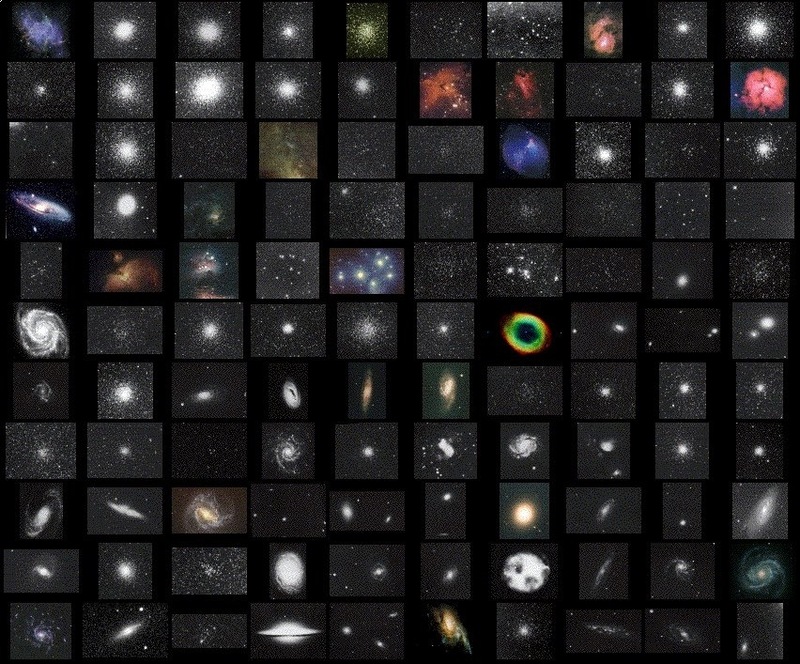 Which of these 4 Messier objects is your favourite? My real favourite is M51 of course. M51 is one of my favourites too.